What is Thanksgiving without buttery mashed potatoes? In our home we love them with garlic; lots of roasted garlic. We love garlic so much the rest of our family thinks there is something wrong with us, even our kids say "garlic is our favorite ingredient!" Try this recipe, and the bold fluent taste of roasted garlic paired with sweet butter will have you withholding the gravy. All ingredients will need to be at room temperature, as to not cool the potatoes. First, you will need to roast the garlic. Remove the loose skin on the outside, then cut of about a 1/2" of the top of the head. Allow garlic to cool then squeeze head to remove garlic. Prep Note: I recommend prepping the garlic the night before, one less thing to do on the big day. 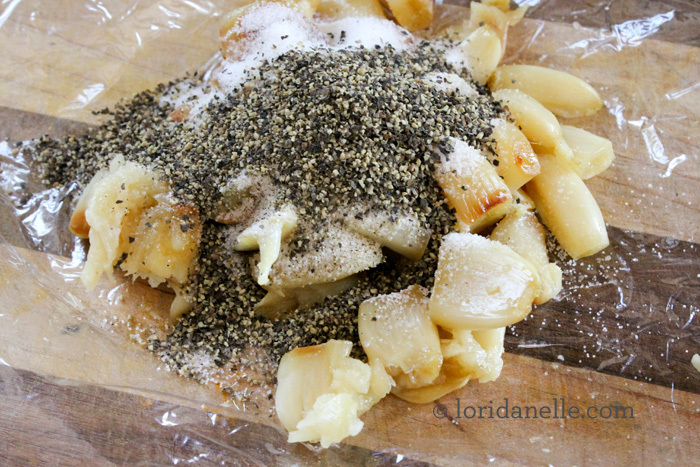 Squeeze garlic into plastic wrap then add the salt and black pepper. Twist the plastic wrap closed and place in the fridge. Remember to remove it from the fridge in time to raise it to room temperature. Additional Notes on Roasted Garlic: We love roasted garlic, and it's good for you. 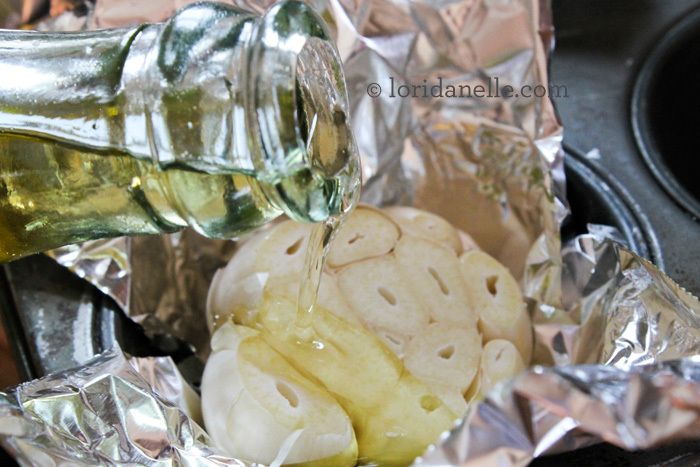 Keep roasted garlic in the fridge for pasta, garlic, and Pecorino Romano pasta. You can spread it like butter on a crusty bread. Or you can do like I do, and eat it whole. Let me know what you like to do with roasted garlic. While the garlic roast; dice the potatoes, I leave the skin on, and place them in a large stock pot. Cover them completely with water, and bring pot to a boil. Boil potatoes until easily pierced with a fork ~15 minutes. 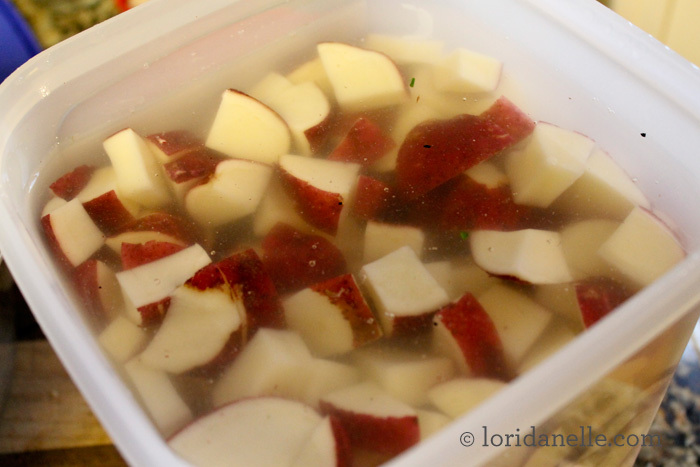 Prep Note: I recommend cutting the potatoes the night before and storing them in the fridge covered with water. I have left potatoes like this for a few days, but check with the USDA, or your health department before taking my advise on storage durations. Combine potatoes, garlic, salt, pepper, cheese, and begin mashing with a........this is where I should tell you to be a purist, and mash them by hand with a potato masher or fork, but I use a KitchenAid mixer. While mashing add butter tablespoon by tablespoon. Add salt and pepper to taste.